Kundalini Yoga was brought to the West, in 1969 by Yogi Bhajan. His goal was to teach students to teach Kundalini Yoga, to spread the teachings.The primary objective of Kundalini yoga is to awaken the full potential of awareness in each of us. This means to recognize our awareness, refine that awareness, and expand that awareness to our unlimited Self. Clear any inner duality, create the power to deeply listen, cultivate inner stillness, and prosper and deliver excellence in all that we do. Kundalini energy is the energy that is deeply seated in our root chakra. We awaken the Kundalini energy by practicing Kriya, Pranayam and meditation.The Kundalini energy will help balance our chakra and meridian systems, as well as the glandular and nervous systems. A Kundalini practice will consist of an opening mantra where we ‘Tune in’ to our creative wisdom and our higher consciousness; Pranayama (breath work),Kriya (yoga set), Relaxation and Meditation. We close the practice with a beautiful affirmation.Some of the benefits of Kundalini yoga include a supple, strong body, a connection with our higher consciousness, conscious living. Learning to live in harmony with the self and others. Join me on Tuesday’s at Carp Ridge EcoWellness Centre from 12-1pm. From pineapples to tomatoes; oysters to beef, the possible answers to the question ‘what’s for dinner’ are endless. That being said, many people don’t know where to start. And now that we are creeping into the summer months, few people want to spend the time inside cooking, when they could be spending that time outside. So here is a great, quick dip that can be made for parties or an evening on your patio. Mix the yogurt, nutritional yeast, chill powder and salt well. Layer the remaining ingredients as follows (bottom up): Beans, yogurt mix, avocado, jalapeños, salsa, lettuce, tomatoes, scallions. Serve with crackers and sliced mix vegetables! When we have to make the hardest decisions or over come obstacles we look inward to find inner strength. This inner strength helps us overcome, make hard choices, deliver the goods. So what exactly is inner strength? Do we all have inner strength? How can we tap into this inner strength daily? Trauma is one of the first ways we begin to start moving this energy. In a trauma we have to find inner strength to survive. This inner strength becomes the power of survival. It gives us the energy we need to source the right interventions to heal from. Goals and Intentions also show us our inner strength. Through intentions and goals, we achieve. From achievement we feel gratification and we find more inner strength. Elite Sports and competition are another way to find inner strength but this path of inner strength can really be dictated by the ego unless trained other wise. Through sports we train our physical and mental bodies to push past physical limitations. We find inner strength to move past these physical barriers to become the best at our sport. Raising children will also require inner strength as they press our buttons and patience. They also give us responsibilities and routines which will at times require strong inner strength to keep up with. Happy Birthday Inner Revolution! Wow, what a ride. I cannot believe we turn one on April 7th. This yoga studio was born out of a love and passion for yoga. Yoga has changed my life is so many positive ways. 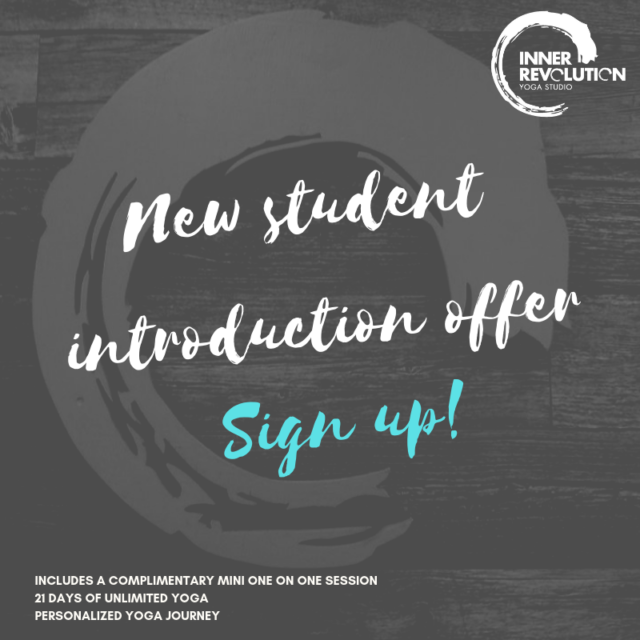 After one year we have now witnessed Inner Revolutions happening in almost each and every client who steps onto their mat. We create balance in ourselves and this in turns inspires wellness. To commemorate our one-year anniversary, I would like to voice the heart and soul of this company share with you my BIG HAIRY AUDIACIS GOALS. THE HEART OF IR: Connection-To teach yoga, true mind body spirit connection (something you can see and feel) to as many people as possible. Inspiration- Inspiring wellness through the connection of the mind, body, spirit. Our BIG HAIRY AUDACIOUS GOALS! Our intent is to bring yogic curriculum into the education system. Develop and help implement yogic curriculum from kindergarten to grade 12. If our future generations were to develop a practice of breathing, meditation, and postures the world we be a whole lot different. We are in the process of clearing land in Nova Scotia on the Bay of Fundy to build an ashram were we can teach, inspire and lead the new generations of teachers on their Inner Revolution. Written from the heart with boat loads of gratitude to the community we are building.